To mark the end of the three-year research project Ecosystem Services Assessment of Satoyama, Satochi, and Satoumi to Identify a New Commons for a Nature-Harmonious Society (New Commons), a one-day symposium was held at UN University Headquarters in Tokyo on 30 January 2012. Satoyama and satochi are mosaic landscapes consisting of different ecosystems along with human settlement. Satoumi refers to human interaction with marine-coastal ecosystems. The project attempted to demonstrate the degree of human intervention for optimizing ecosystem services without losing biodiversity, and explored policy options for rebuilding a nature-harmonious society. The project further studied the changes and the drivers of those changes in satoyama and satoumi ecosystem services, as well as the impacts on human well-being. It was intended to address some of the information and research gaps identified by the Japan Satoyama Satoumi Assessment (JSSA), conducted between 2007 and 2010. In addition to reporting on the final project findings, the event welcomed two international keynote speakers who have been involved in the JSSA. The first keynote speech was delivered by Dr. Anantha Kumar Daraiappah, Executive Director of the International Human Dimension Programme on Global Environmental Change (IHDP). In his presentation, “Valuing humanity’s life support systems”, Dr. Daraiappah urged us to place this important research within a broader economic and development perspective rather than focusing exclusively on the environment, so that we may convince “non-believers” that the environment forms a critical pillar within these other fields. This is becoming increasingly important, he said, as although many acknowledge that we have a crisis on our hands, in fact, “we have multiple crises that are leading into a perfect storm”. “We are past the need for incremental changes,” he warned. “We need a paradigm shift.” Borrowing a term from Nobel laureates Joseph Stiglitz and Amartya Sen, Dr. Daraiappah argued that we are “mismeasuring” our lives by focusing so closely on measures like GDP that lack social and well-being dimensions and also leave out any measures of sustainability. Instead, the “right question” that we should be asking ourselves, he said, relates to “human well-being”. Linking into the broader themes of the symposium, Dr. Daraiappah explained that satoyama landscapes produce a bundle of ecosystems for human well-being. The second keynote lecture was by Prof. Eduardo Brondizio, from the Department of Anthropology at Indiana University. Using the example of a settlement of Japanese farmers in Tome-Açu in the Brazilian Amazon region, Prof. Brondizio spoke on “Governance of socio-ecological systems in an interlinked world”. Drawing from knowledge of satoyama and social capital, the Japanese immigrant farmers have used systems based on sound ecological principles and market logic and were able to become successful agricultural cultivators, balancing economic vitality and environmental concerns. His observation that “the environment shapes the way people do things, and the way people do things shapes the environment” encapsulates the broader message of the research and the symposium: that environmental policy cannot be constructed in isolation. The emphasis needs to be on harmonious interaction between humans and nature. 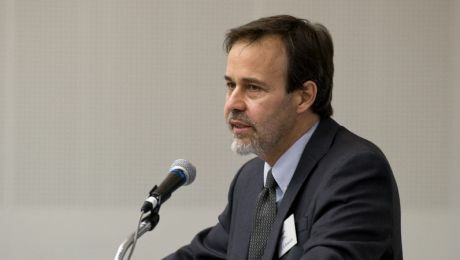 The symposium also included a special session on the implications of the disasters following the 2011 Great East Japan Earthquake (i.e., tsunami and the Fukushima nuclear plant accident) on the ecosystem services derived by satoyama and satoumi and the rehabilitation efforts in Japan. The presentations were followed by a roundtable discussion in which a number of researchers from the initiative provided the audience with further views and comments in light of the information presented during the talks. A webcast of the symposium, and related videos, is available on the UNU video portal. Five research teams (UNU Institute of Advanced Studies (UNU-IAS), National Institute for Environmental Studies, Yokohama National University, University of Tokyo, and Research Institute for Humanity and Nature) carried out the project with support from the Ministry of the Environment, Japan and coordination by the Ecosystem Services Assessment (ESA) initiative at UNU-IAS.